Push it real good, gentlemen. AttitUde. Hard-fighting soldiers. All In. Salt ‘n’ Peppa. These are the inspiring motto championships are born of. Thankfully, Auburn defensive ends Craig Sanders and Corey Lemonier know this. Their hair knows this. “The rumors are true. The dynamic duo arrive,” Sanders tweeted Wednesday evening, along with a photo of himself and Lemonier in the Auburn weight room. The rumor? 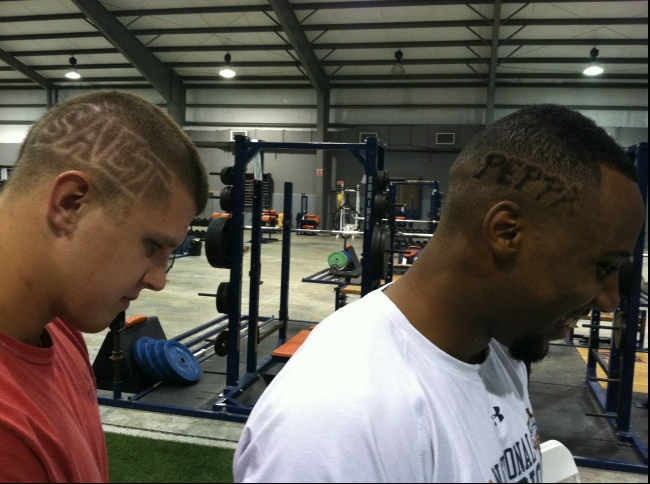 That Auburn’s special-teams sensation and its resident Nagurski watch-lister reported to fall practice with “SALT” (Sanders) and “PEPPA” (Lemonier) shaved into their scalps. Salt and Pepper? That’s team chemistry. T’is apparently the season of Auburn body art. Last month, former Auburn star Lee Ziemba had blogs drooling with tweeted photos of the largest Auburn tattoo known to fankind. Here’s a video of him talking about it. One should have shaved 5 and the other 7…for api’s record this year.